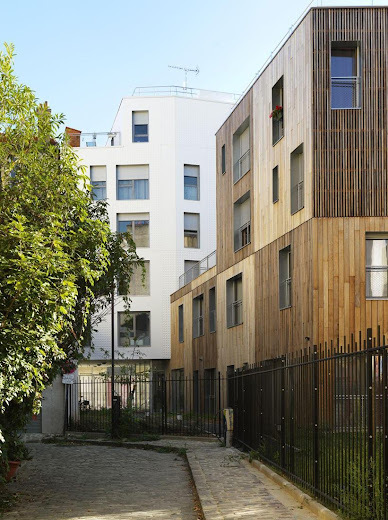 The site of the transition house and social housing units on rue des Thermopyles encapsulates the district’s overall qualities and problems. 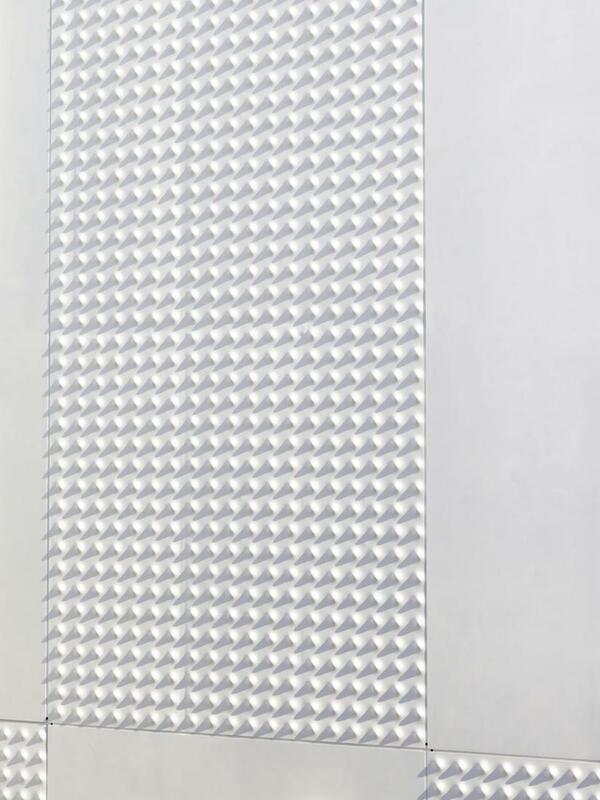 The plot provides a transition between two scales and two construction histories in the locality. 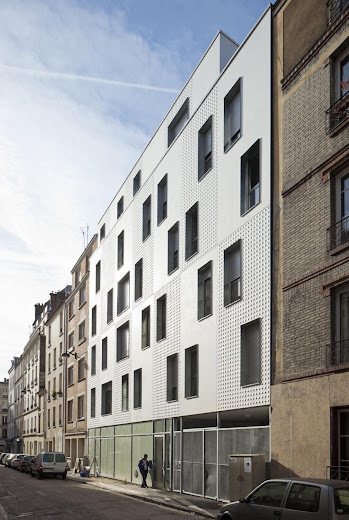 To the north, rue de Plaisance, a typically outer Paris street lined with medium-size, four and five-storey buildings and other higher buildings in grey and red brick, sets the general architectural tone and amplitude. To the south, rue Boyer-Barret, with its Haussmannian façades, defines the visual limits of the surrounding urban landscape. Rue des Thermopyles runs between these two parallel streets. 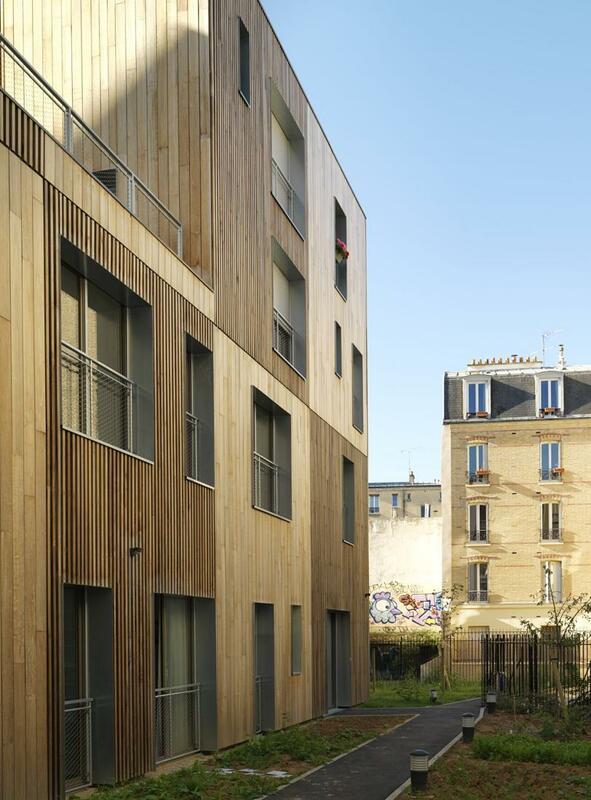 Its workshops, vegetation and courtyards are on the pleasant small scale often typical of Paris’s peripheral districts. These two urban fabrics are interspersed with a succession of green plots between the squares on rue Didot and the public garden on rue des Thermopyles. 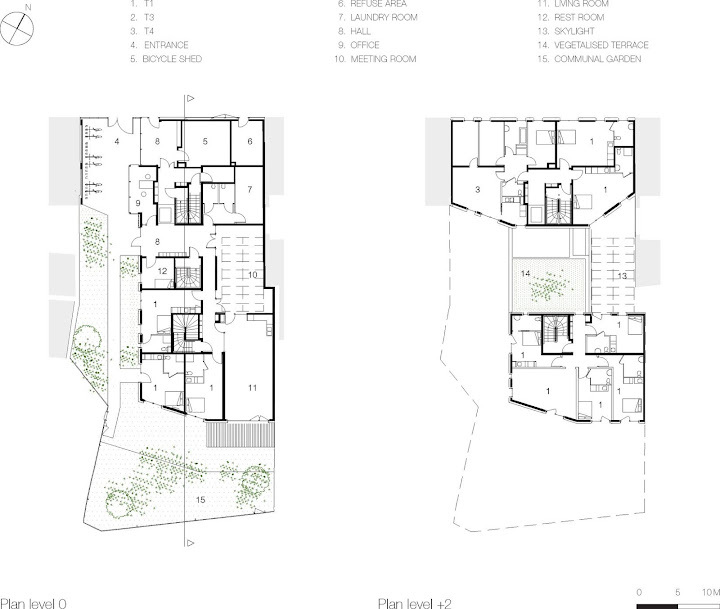 The project is a response to this eclectic mixture of scales and typologies and the need to fully integrate it into local life. 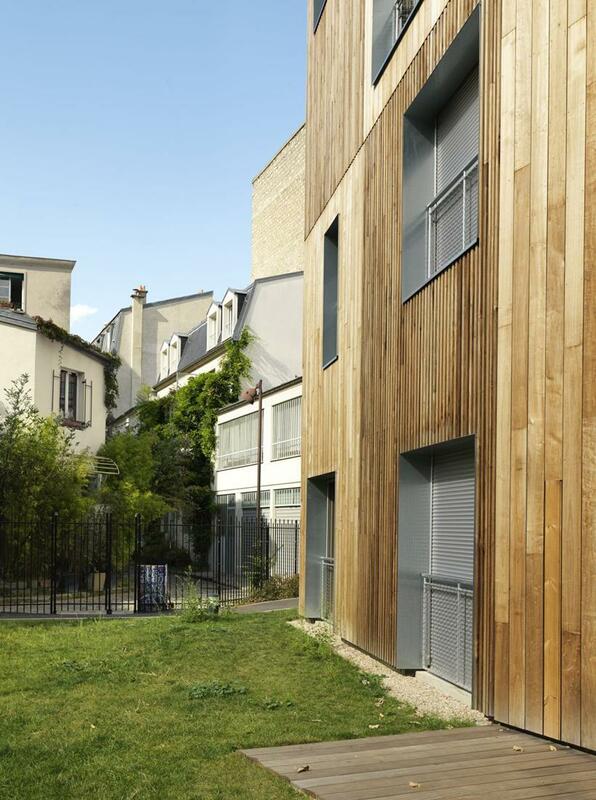 The plot’s central location in the local urban fabric was a major consideration. Its site and rue des Thermopyles had to create a dialogue since they provide reciprocal spatial openings. 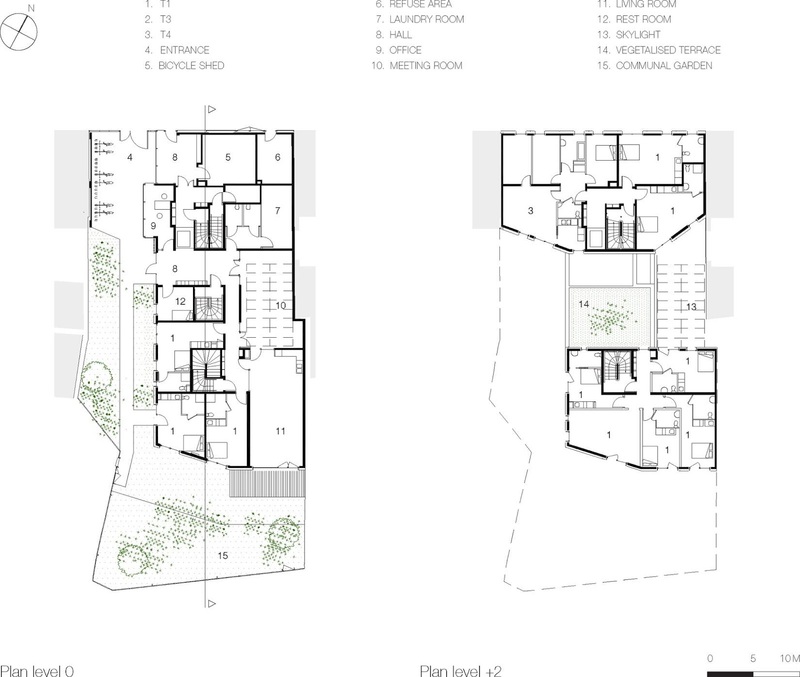 The plot’s interest lies in its transversality and its multiple and sequential relationships with the different typologies of its surroundings. It demanded the realisation of a complex urban graft requiring frontality, depth, linkage of scales and typologies, treatment of gables, wide openings and a passageway between two streets. Our reflection focussed mainly on the buildings’ volumes and their sunlight exposure. 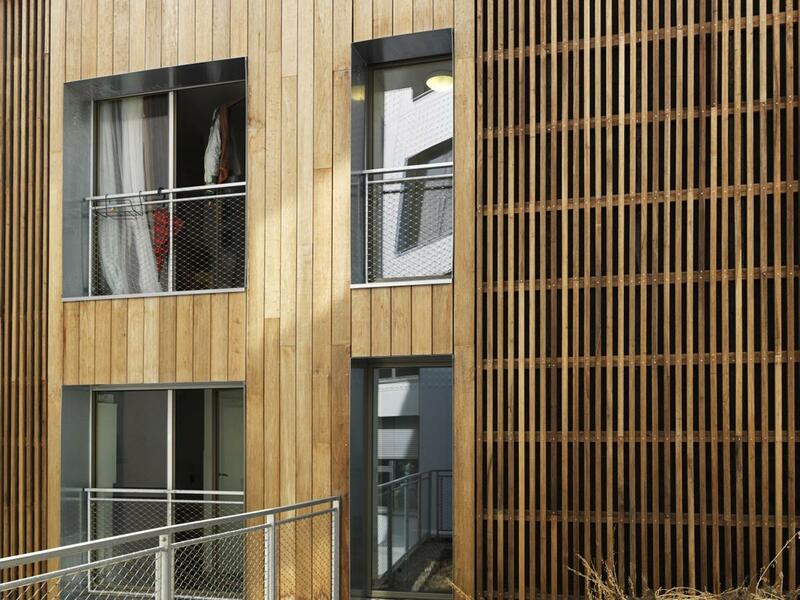 The first stage of conception was to work on the compactness of the volumes for urban and energy performance reasons. 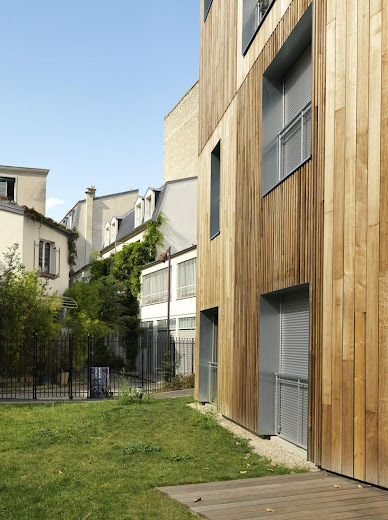 The second was to integrate the project into the urban fabric, respecting the voids of the surrounding courtyards and gardens. 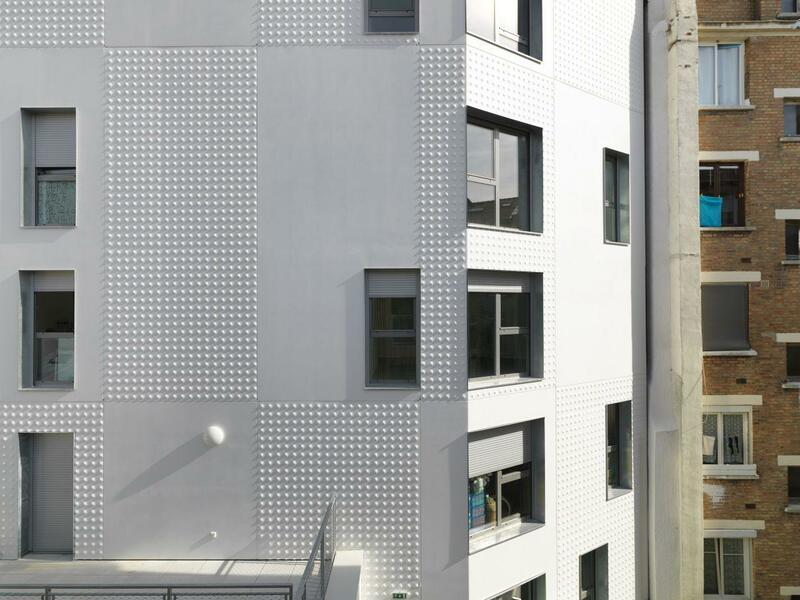 The existence of a dual typological scale and the project’s combined programme naturally led us towards two constructive entities. These two entities are distinct yet communal and interlocking. The wood-clad transition house, aligned against the wall of the neighbouring building, exploits the plot’s depth and ensures full contact with life on rue des Thermopyles. 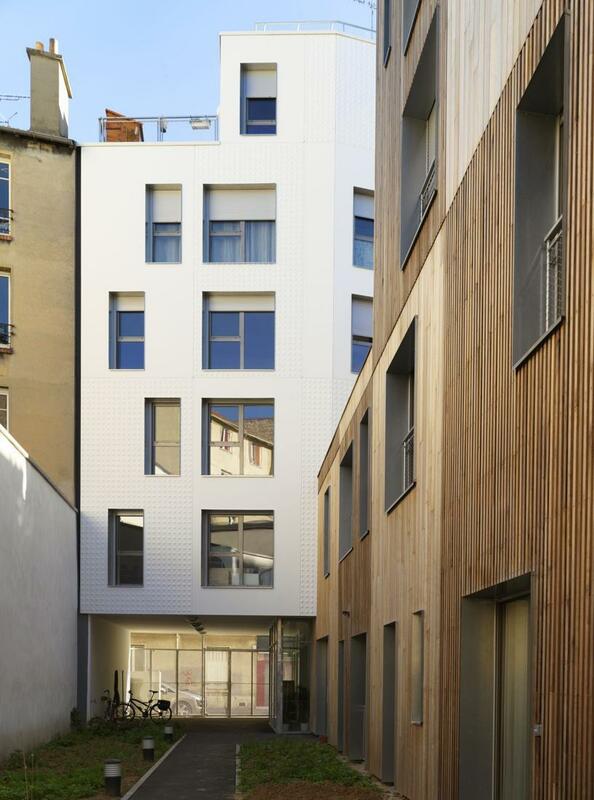 On the rue de Plaisance side, the five-floor white building with a stepped-back top storey adapts to the overall scale and volumes of the surrounding architecture on the street. 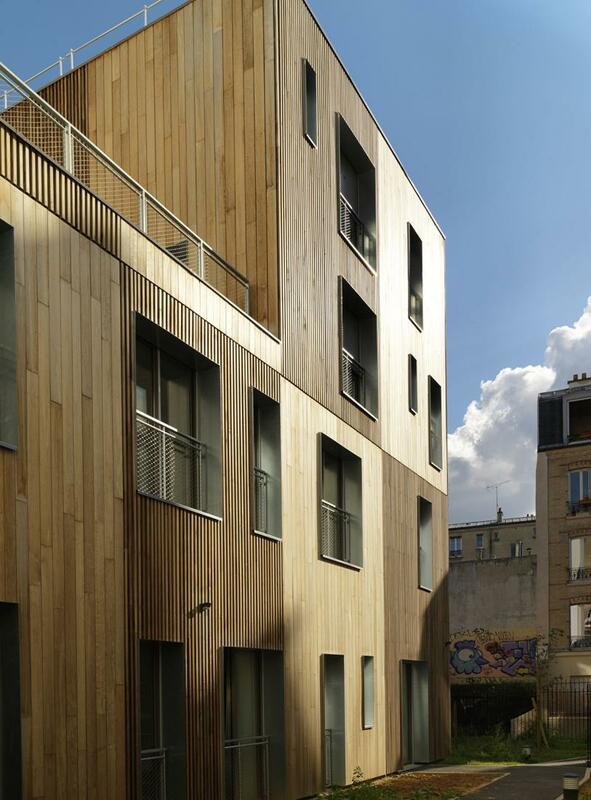 Although it is perfectly aligned on rue de Plaisance, the programme’s large apartments tended to thicken this volume on all floors. It was this constraint that was the key to defining the project. 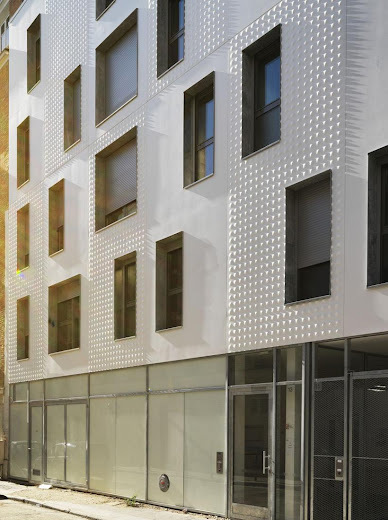 In total continuity with the neighbouring gables, the creation of facets on the south façade ensures the building’s integration into the urban fabric and excellent sunlight exposure. 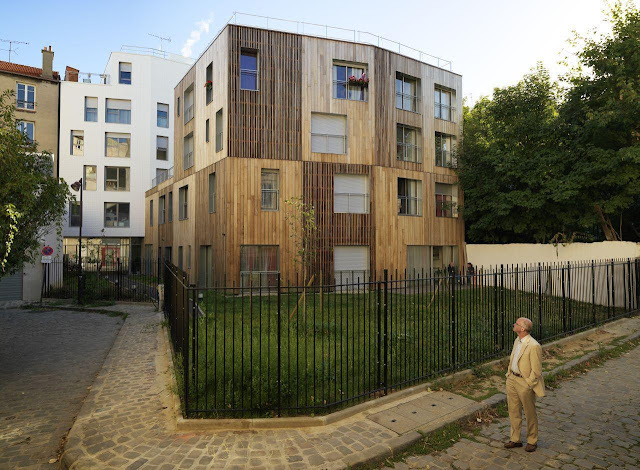 The white mineral building is the project’s urban façade, while the wooden building belongs to the greener environment in the garden of the transition house and in the public garden on rue des Thermopyles. 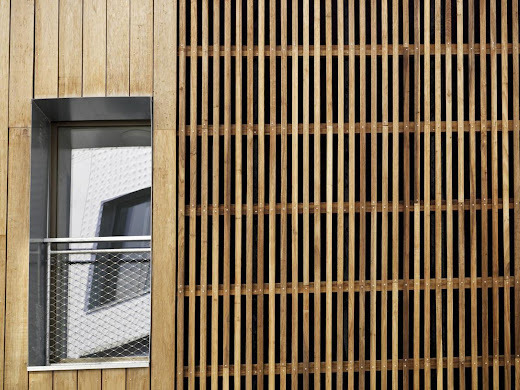 The transition house is in the wood-clad building. 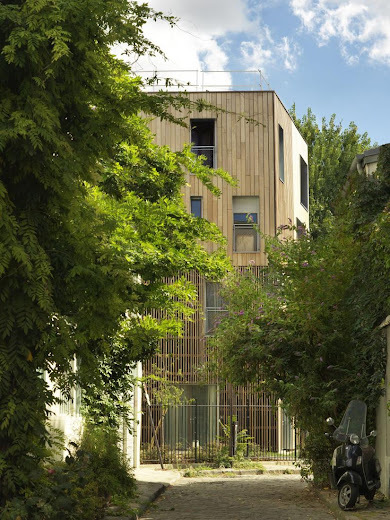 Aligned against the wall of the neighbouring plot, it creates a private passageway between the two streets and maximum sunlight exposure both on the plot and in rue de Plaisance. All the transition house’s communal spaces are on the ground floor. The office is on the passageway and visible from the street. The gateway provides a wide, light but intimate access to the housing units and transition house. The communal living and meeting room, combined in the same space, create a hub for the house’s collective life, social cohesion and cultural activities. 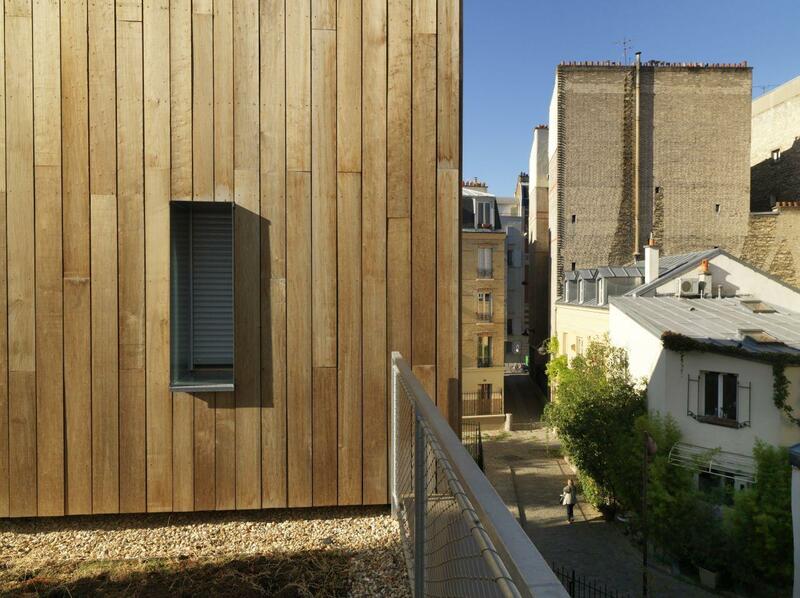 The terrace acts as the exterior extension of these spaces and activities and could eventually play a role in the district’s social activities (street parties and meals). 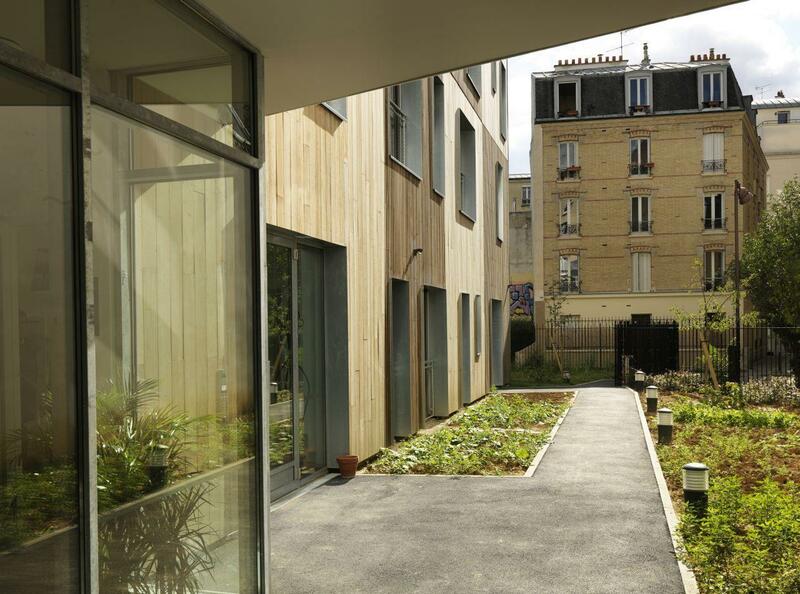 The communal living room, with a skylight for maximum sunlight, echoes the existing contructions in the succession of courtyards behind the buildings on rue Plaisance. The fourteen social housing units are in the white building, giving onto rue de Plaisance and the centre of the plot. 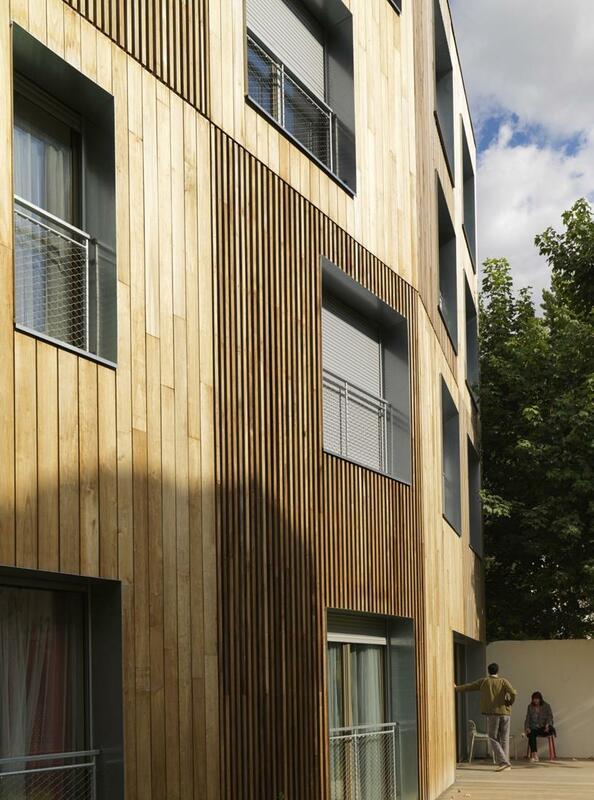 The large units are through apartments and some units have terraces. Their high windows provide maximum daylight, even in the bathrooms. Each landing serves two or three units. A private passageway runs through the building from rue de Plaisance to rue des Thermopyles, providing access to the social housing units and transition house. From the gateway on rue de Plaisance, it opens out into a green environment that ends in a garden providing privacy for the transition house’s ground-floor units. 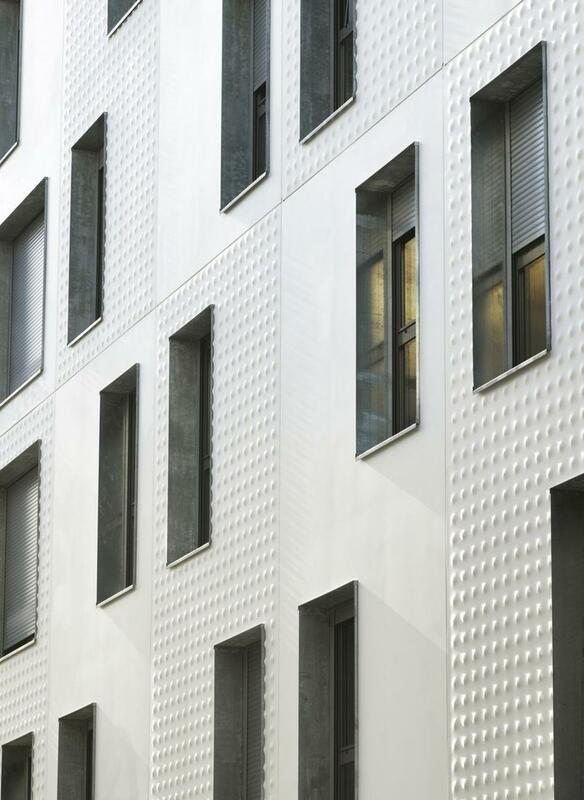 The façade materials were chosen in function of two different urban environments. The first, associated with the street, is more mineral and inert. 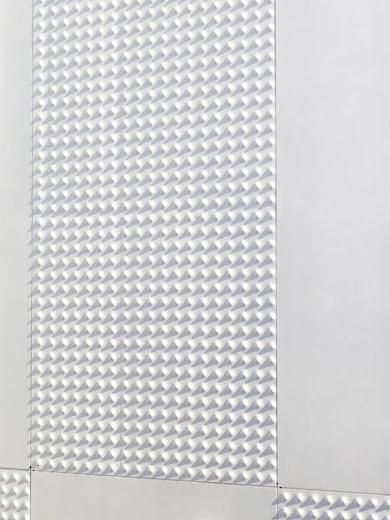 The upper volumes are clad with a chequerboard of smooth and studded Corian panels. 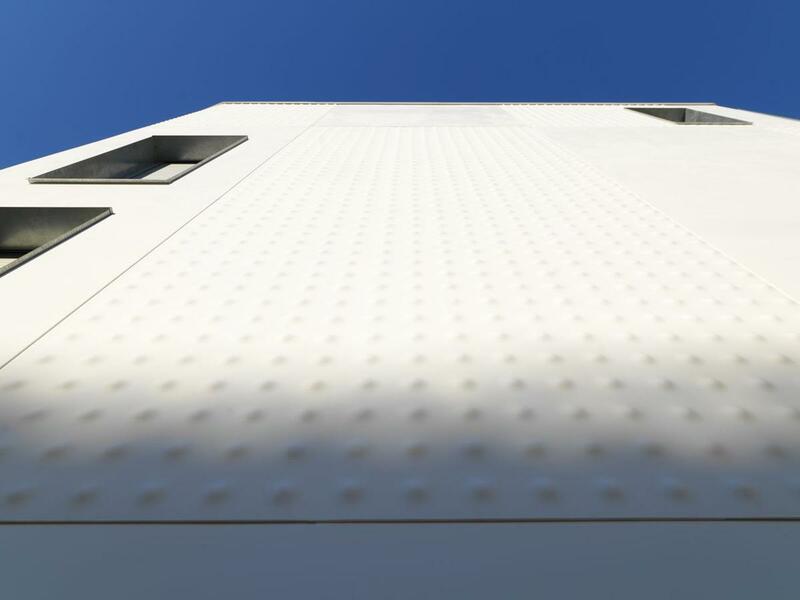 The variations in the openings and the Corian panels adapt the facade to the varying scales on the street. 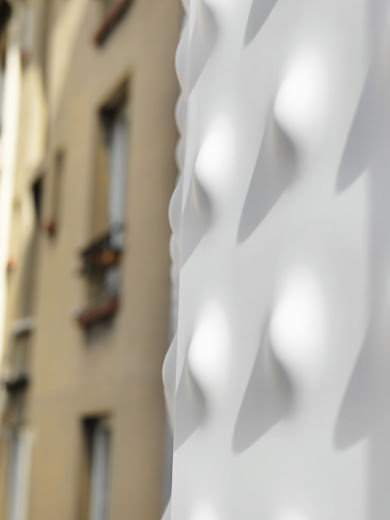 The thermo-moulded relief on the façade catches the light, creates a dynamic and casts shadows that vary with the light. The whiteness and purity of the Corian contrasts with the texture of the galvanised steel window frames. The window frames of the mineral volume are in steel. 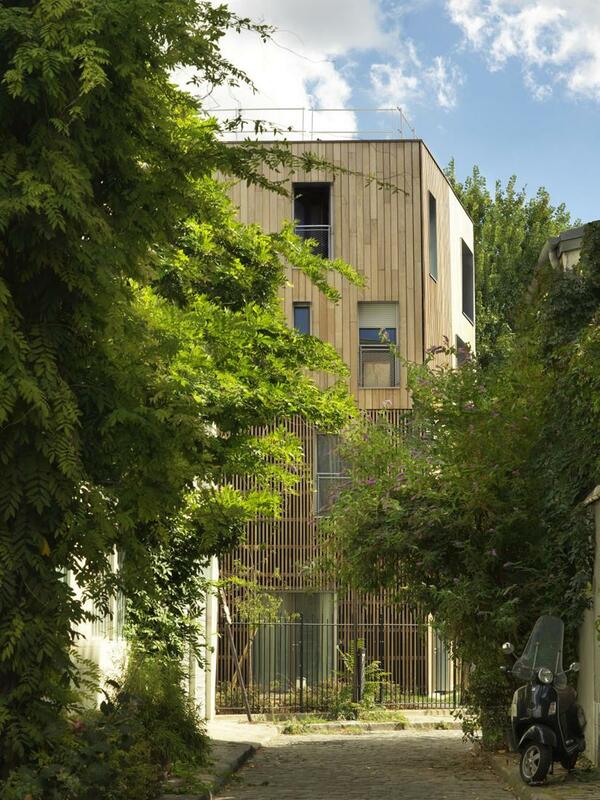 In contrast, the building inside the plot is organically clad with a chequerboard layout of retified poplar planks and spaced timbers harmonizing with the plot’s vegetation. The wood and aluminium window frames are also in galvanised steel. 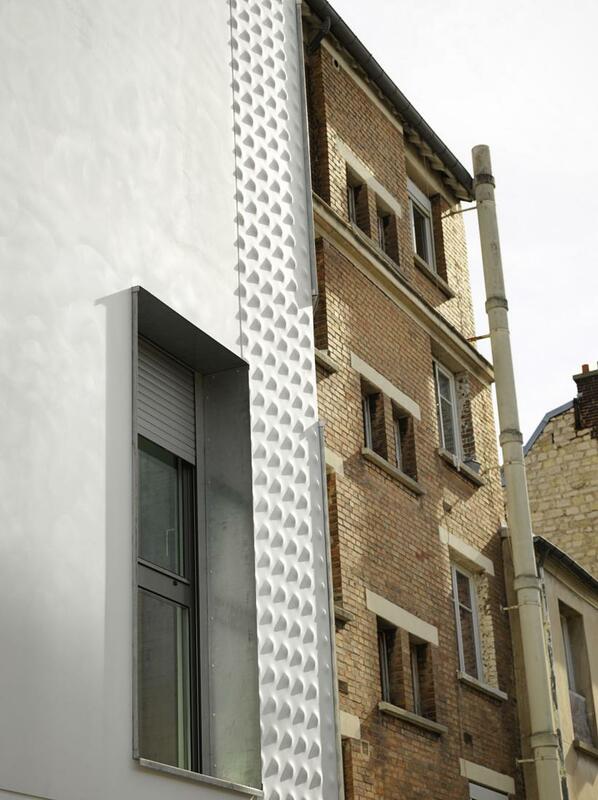 These two materials also create a continuity with the district’s traditional Parisian buildings, which have brick street facades and rendered walls on the courtyard or garden side. 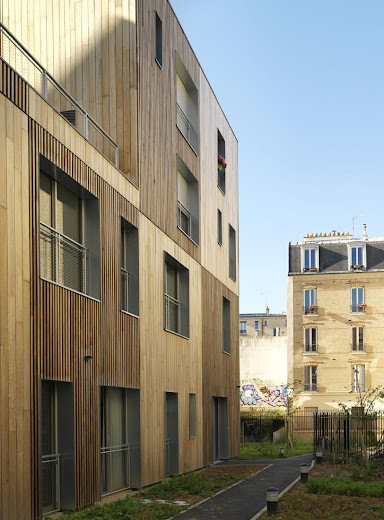 The white exterior on the street and wooden interior of the plot visually express the project’s total integration into its context and the district’s history, whilst using materials still unusual in Paris.